What’s the Difference Between Conditional and Unconditional Love? The topic of conditional and unconditional love is addressed with almost every client I work with. Although some people would say “If it’s conditional, then it’s not really love,” it is just a way of speaking. We use “conditional” as a framework of what we are speaking about. 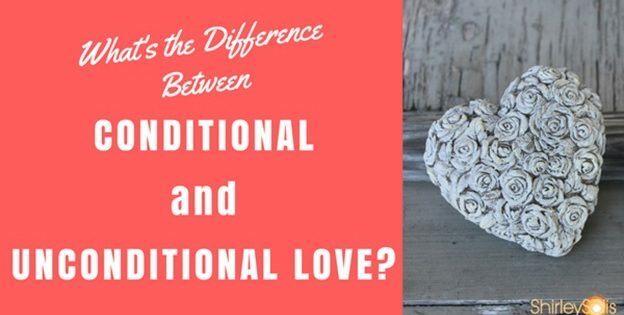 When I address the topic of unconditional love with clients, most of them are clueless as to what it really means- perhaps because love is an abstract concept. Think about it… what is love anyway? How would you define it? Is it a feeling? Is it a behavior? Is it a knowledge or awareness expressed to myself and others? Even though there are many types of love each of us is familiar with, we are going to focus on conditional and unconditional love. We will start by defining unconditional love. I don’t necessarily know there is a specific definition of love everyone would agree upon, but it is a knowing you are loved…you are accepted, affirmed, cared for, safe. If you love me, then you accept me the way I am. You understand me and my needs. I don’t need you to change for me to be happy, and I do not need to change for you to be happy! Unconditional love is about seeing the person for who they are – seeing their highest potential without seeing their behaviors. We all make mistakes, but with unconditional love, you understand a person is not identified by their behavior. You can love this person for who they are and how they were created. What are the Clues of Unconditional vs Conditional Love? In essence, “have to” is being forced to; it is not truly loving. You are not doing it out of your own good will, rather you are doing it out of perceived obligation. Are you harboring bitterness towards a person for their behavior? In that case, you are loving them conditionally. Unconditional love brings “get to.” It creates freedom, detachment and the ability to love and accept everyone, including yourself. How Do You Start Loving Unconditionally? Is it possible to love someone unconditionally at all times? I believe it is possible, but we do not always accomplish this. We come to an awareness, and then traverse in and out of unconditional love. The first step is to explore unconditional love, and then to step into it. Strive to step into unconditional love as often as possible in all the relationships you have, including yourself and God. For me, God was an idol to me. I chose to follow Him because I thought I would get certain things. It was not a conscious decision; it was a realization I came to about 13 years later. Your relationship with God should not be, “If I follow God, my life will be good.” Of course, there is always that possibility, but following God should not be an insurance policy. As you begin to explore the concept of unconditional love, you understand what unconditional love means and make yourself aware of deliberately stepping into this type of love. It will not happen overnight; it could take months, or in my experience, even years to accomplish. It can become difficult because as you explore unconditional love, you run into new questions. Such as, what is grace? What is mercy? Forgiveness? Acceptance? After you have asked the questions, and then stepped into unconditional love with your closest relationships, then you want to demonstrate behavior with all your relationships. Choose to be in unconditional love. It may take time; you may even need help from someone you trust. If you are having trouble finding help, I would be happy to provide assistance to you! Eventually, seeing when you are loving unconditionally and when you are loving conditionally, will be easier to recognize. If you would like to learn more about the concept of unconditional love, I created a personal video for you to watch, where I share more about the concept and implementation of unconditional love. Youtube Link: What is the difference between conditional and unconditional love? The degree which you love and accept yourself, is the degree you can love others! And, let me know what you learned about unconditional love in the comments below.